As was expected, Flipkart have retained their increased affiliate commissions that were earlier announced to be valid only till July 31st. Flipkart has sent out a mail to all their affiliates that the prevailing commission rates for July have been extended till August 31st. They have not only retained it, but have also increased it one category – For Ebooks, Flipkart will be offering affiliate commission of 15 percent. This is one of the highest affiliate commissions as compared to any other e-commerce website. 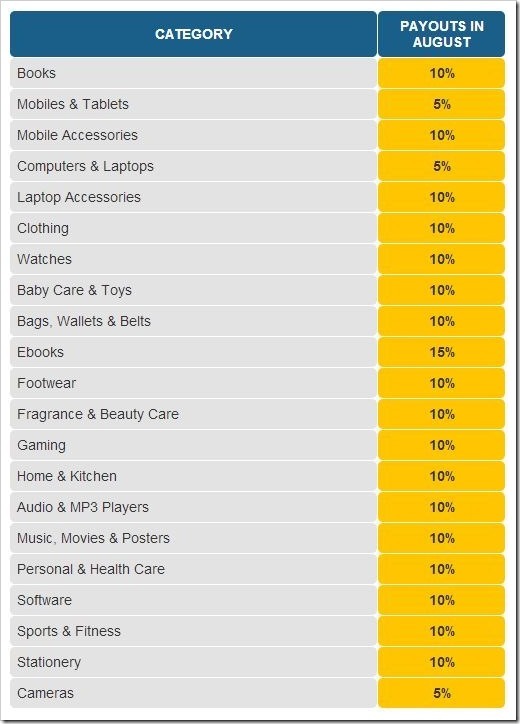 Mobile & Tablets, Computers & Laptops and Cameras are the three categories where Flipkart is offering 5 percent affiliate commission. All other categories now offer 10 percent, except ebooks which has 15 percent. One thing is clear – Flipkart is take Amazon’s entry into India quite seriously. Before Amazon made its way into India, Flipkart had never increased their affiliate commissions. They used to generally offer lower commissions as compared to other e-commerce sites in India. However, this changed drastically after Amazon has come in. Starting July they upgraded their commission structure by nearly 10 times in some categories. Here is a neat comparison that we did a few days ago of Affiliate Commissions offered by Various Indian E-Commerce sites. Though, Flipkart has mentioned that these rates are valid till August, we are quite sure that they will retain those rates till foreseeable future. Obviously, they don’t want affiliates to promote likes of Amazon further. Govt To Offer Free Mobile Phones To Female Workers… But Why? Yes, the affiliate pricing is very good… but the credibility of weather the links are tracked or not still remains a mystery!!! Only God knows….